Objectives: I can show how contemporary Europe was shaped by events in its past such as: the formation of democratic government. I can identify and describe the influence of classical Greeks on modern democratic governments. 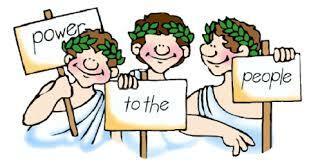 I can identify the origins of democracy in the governments of Ancient Greece and the Roman Republic. I can explain the duty of civic participation in ancient Greece. Ancient Greece is known as the "cradle of democracy". Once ruled by kings and nobles. Athens eventually replaced tyrants, men who forced their way to power and ruled harshly and selfishly, with "rule by the people". In 580 BC, a number of changes were made to Athenian government. People were now allowed to choose their rulers and to vote on important issues. Athens became the world’s first democracy. Democracy comes from Greek words meaning, “rule by the people”. Use the resources provided to learn about the government of Ancient Greece. 2. Click HERE to complete an activity about the government. Make a copy of this document, complete the activity. Be sure to save this document to your Ancient Greece and Rome folder in Google Drive.